Why hello there! It’s been awhile, hasn’t it? I had a nice Christmas with my family (including 25 people or so for Christmas dinner), made lots of cookies, ate lots of food and then was hit hard with that crud that’s going around. I even lost my voice for a few days – it was rough. Then of course boyfriend caught it from me, and we just pretty much spent the rest of the holidays sleeping and eating soup. Oh well. At least it was a bit of enforced rest. I didn’t knit many gifts this year, pretty much just one! 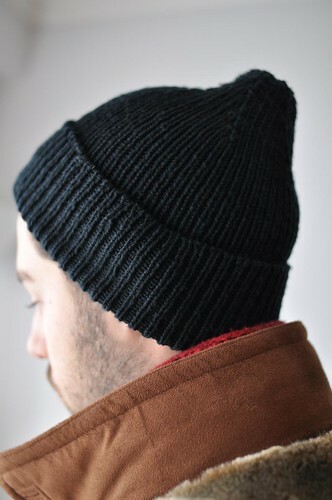 A hat for D, to replace his well-loved-but-acrylic everyday toque. I used a skein of Louet Gems sport weight and 3.5mm or so needles. Cast on 120 sts, work 1×1 ribbing forever and then decrease. I prefer a more rounded shape in my own hats, but he likes the little pointy bit. The Gems merino is nice and stretchy, and soft without being floppy. Plus it’s been worn every day since being finished – a winner, I think. So what’s up for 2013? Lots of changes happening around here. I’m not really one for resolutions, but with more people heading back to Flickr and getting back to taking photos, I’ve decided to try my hand at another round of 365. This time, I’ll be posting a photo for every day, but of varying things (self portraits, food, lots of knitting). They won’t all be awesome photos but I’m looking forward to some more journalling and documentation of this year. It should help with the blogging, too, since I’ll have lots of photos to put up! You can follow me on Flickr here if you’re interested. So along with getting some projects off the needles, I’m going to be getting some things out of my office closet! A studio sale will be coming soon, with yarn, samples, books and much more. I’m actually really excited to give some things a new home – I hope you’ll all help me out! Did you finish the brown sweater with the collar, and I think a zip front? 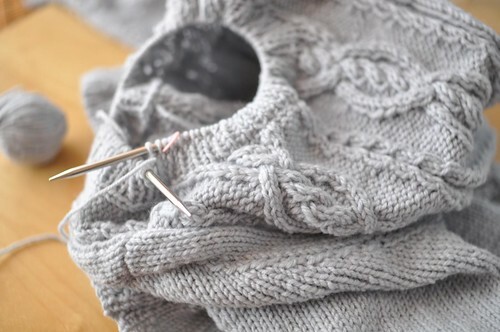 That sweater looks gorgeous – I’m glad you rediscovered it and looking forward to the pattern. Looking forward to seeing what comes out of the cleaning session!